Resolved: Debate Win for Inmates Against Harvard Shows Benefits of Higher Education Behind Bars | Democracy Now! founder and executive director of the Bard Prison Initiative. He conceived of and created the Bard Prison Initiative as a student volunteer organization when he was an undergraduate at Bard College in 1999. He is a 2014 recipient of the Smithsonian American Ingenuity Award in Education. Despite their stellar record, a loss by the Harvard University debate team wouldn’t normally be national, let alone international, news. But one match last month wasn’t your typical sparring contest. Three members of the Harvard team squared off with opponents not from a rival university, but a maximum security New York prison. The topic was whether U.S. public schools should be able to deny enrollment to undocumented students. Despite being forced to advocate a position they don’t agree with, the prison team was declared the winner. The story went viral across the United States and around the world. 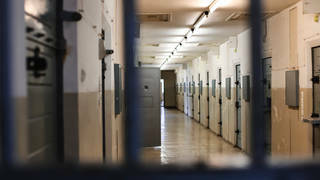 The prisoners were debating as representatives of the Bard Prison Initiative, a program that offers inmates a college-level liberal arts education. Since its founding in 2001, more than 300 alumni have earned degrees while behind bars. We are joined by Max Kenner, founder and executive director of the Bard Prison Initiative. JUAN GONZÁLEZ: Despite their stellar record, a loss by the Harvard University debate team wouldn’t normally be national, let alone international, news. But one match last month wasn’t your typical sparring contest. Three members of the Harvard team squared off with opponents, not from a rival university, but from a maximum security New York state prison. The topic was whether U.S. public schools should be able to deny enrollment to undocumented students. And despite being forced to advocate a position they don’t agree with, the prison team was declared the winner. The story went viral across the U.S. and around the world. AMY GOODMAN: The prisoners were debating as representatives of the Bard Prison Initiative, a program that offers inmates a college-level liberal arts education. Since its founding in 2001, more than 300 alumni have earned degrees while behind bars. For more, we’re joined by Max Kenner, the founder and executive director of the Bard Prison Initiative, 2014 recipient of the Smithsonian American Ingenuity Award in Education. It’s great to have you with us. Describe the scene. Where did this debate take place? How did it take place? AMY GOODMAN: Did the Harvard students come to the prison? MAX KENNER: —the debate being one of them. So, people are interested in rhetoric, in public speaking and debate, and that got to the point where we started doing regular intercollegiate debates once a semester. We start with West Point. We debate the cadets from the West Point Academy every spring. And we did well, and it was exciting and fun. MAX KENNER: So we invited Harvard to come, who was the national champion last year. And so far our record is three and one with the debates. JUAN GONZÁLEZ: And the inmates, your team, argued against providing assistance to undocumented students? MAX KENNER: That’s right. Sure. It’s a little more technical than that, but that’s boring, yeah. AMY GOODMAN: Now, but did the Harvard students come to the prison? MAX KENNER: That’s right. Everything happens in person. Nothing happens remotely. MAX KENNER: In our program, in the classroom and otherwise. AMY GOODMAN: So they come to a maximum security prison. AMY GOODMAN: And they debate this? MAX KENNER: Sure. So it’s a large auditorium, same place where we have graduations and what have you. In the audience were over a hundred other incarcerated Bard students and a scattering of faculty and other friends of the program. And then there’s a stage. And then there were three Harvard kids on one side, three of the incarcerated Bard students on the other, and a panel of judges. JUAN GONZÁLEZ: Who were the judges? MAX KENNER: Judges are people who do this professionally, work in that profession. AMY GOODMAN: And how did the prisoners feel? MAX KENNER: Look, anytime you get on a stage and are forced to, you know, articulate something clearly and be judged how well you are and clearly you are articulating it as compared to someone else, that’s causing anxiety. And, you know, I think it’s amazing how much the media has responded to the fact that Harvard might lose. You know, we’ve been doing this for a while, and just how special it was didn’t quite dawn on us until two weeks later after the event. This was still the most popular story in The Wall Street Journal. It sort of amazed us. JUAN GONZÁLEZ: What was the reaction of the Harvard team and the Harvard coach? MAX KENNER: You know, to their credit, I don’t think they thought it was extraordinary, either, you know? I think they maybe, you know, wish they had prepared a little more. I don’t know. You know? MAX KENNER: So, it’s a self-selecting group in that you can join the Debate Union as a Bard student, if you choose, for fun, so something you do, you know, once or twice a week. And then they prepare. And these are people, you know, all joking aside, who are very busy. They’re enrolled full-time in college in an extremely rigorous academic program. And so, while there are 15 or so members of the Debate Union, they sort of self-select the three or four who participate formally in a given competition. JUAN GONZÁLEZ: Did the warden offer them any reduction of their sentences as a result of the victory? AMY GOODMAN: And was the audience prisoners? MAX KENNER: Yeah, our other incarcerated Bard students, that’s right. AMY GOODMAN: I want to turn to a clip from a film that the Bard Prison Initiative produced on the occasion of its 10th anniversary. This is Erica Mateo, who graduated from the program in 2011. ERICA MATEO: Growing up in Brownsville, I always felt like I would end up in prison, because I didn’t feel like I had many options. I’m now working as a case manager, working with 16- to 24-year-olds who have some criminal justice system involvement within the last 12 months. People don’t expect a lot from these kids. And if people actually got to know them, they would prove almost everything wrong. You know, they aren’t lazy kids. They want to work. They’re eager to work. They have dreams, like they want to be accountants and architects. And it brings me a lot of pleasure to see them achieve their goals. AMY GOODMAN: So that’s Erica Mateo, who graduated from the Bard Prison Initiative in 2011. How are the students taught in—who are prisoners? Do the Bard professors come to prison? MAX KENNER: Absolutely. Everything happens in person. And the work is less extraordinary and less novel, I think, than it might seem. Everything we do, the entire—the basic idea of the program is an experiment, is: What happens when we provide the same education, that is typically afforded to the children of the lucky and the entitled and the rich, to others? And the results have been extraordinary. We have, you know, alumni in graduate schools at Yale, Columbia, NYU, people working in management in billion-dollar businesses—and most of all, alumni like Erica, going back to the communities from which they came, serving youth at risk, people with HIV and AIDS, the homeless, etc. JUAN GONZÁLEZ: In the less than a minute that we have left, has this program of Bard’s been replicated in other states at all? MAX KENNER: Absolutely. There’s suddenly a real resurgence in a belief in the place of education in American prisons. And we have a program called the Consortium for the Liberal Arts in Prison, where we work with sister college universities—Washington University in St. Louis, University of Notre Dame, etc. We’re in 11 states across the country. AMY GOODMAN: We’ve heard a lot about the school-to-prison pipeline. You’re talking here about the prison-to-college pipeline. What can be done to help students? Earlier this year, President Obama announced a plan to offer limited Pell grants to federal and state prisoners. What would that mean? MAX KENNER: Well, that will transform the meaning of our prison system back to what it was prior to the Clinton crime bill in 1994, which is to say, though we incarcerate you as a fellow citizen or you as a neighbor, we have not written off the possibility of your contributions to society permanently. AMY GOODMAN: Max, as we wrap up, how did you end up doing this? We only have 15 seconds. MAX KENNER: Oh, dear. Well, I was an undergraduate at Bard College and recognized what’s now common, that the investment we made in punishment over a generation was extraordinary, and that educators have a place in fixing these social problems, and they shouldn’t wait for the government and the public sector to lead the way. AMY GOODMAN: Max Kenner, founder and executive director of the Bard Prison Initiative. He conceived and created the Bard Prison Initiative as a student volunteer organization when he was an undergraduate at Bard. That does it for our program today. We have a job opening, director of development. You can go to our website, democracynow.org, to get the details and send in your résumé.